There’s quite a bit of happenings going on ’round these parts and all over the classic movie blogging sphere, so let’s get right down to it. Throughout the month of June, we will again delve into the well of memory, presenting a selection of movie memories from family, friends, other bloggers–and ourselves! As with last year’s phenomenal event, we have a great array of recollections for your reading pleasure, from first film experiences to reflections on the movies that have helped shape us into the people we are today. We will kick things off Monday with a fantastic post from one of our favorite fellow film bloggers, and additional pieces will go up every other day until the end of the month. We hope you’ll stick around and see what our wonderful contributors have to offer. One of our favorite classic film bloggers, Aubyn of The Girl with the White Parasol fame, is hosting a tribute to one of our favorite classic film stars. The Barbara Stanwyck Blogathon, scheduled for July 16-22, will focus on the extensive filmography and television work of the lovely and talented Ms. Ruby Catherine Stevens. We adore Stany here at True Classics (hell, we devoted the entire month of April last year to her films! ), so we cannot wait for this one. Aubyn’s already lined up a phenomenal slate of contributors, so if you haven’t signed up to participate, head on over to the Parasol and claim a topic for yourself! The Stanwyck blogathon will be preceded a few days earlier by another event, the Dynamic Duos in Classic Film Blogathon. Co-sponsored by the Classic Movie Hub and perpetual blogathon hostess Aurora of Once Upon a Screen, this event (July 13-14) will celebrate famed classic movie pairings, be they romantic, adversarial, familial, or otherwise in nature. The topics are wide-open for this one, and it is sure to be an entertaining event. If you are interested in throwing your hat into the ring, you can sign up at either host’s site. 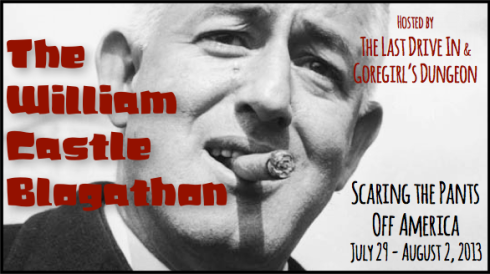 At the end of July, The William Castle Blogathon will shine the spotlight on the famed director/producer of classic B-movie horror/thrillers. Co-hosted by The Last Drive-In and GoreGirl’s Dungeon, this one threatens to “scar[e] the pants off America,” and with good reason (Castle’s House on Haunted Hill is relatively tame by today’s standards, and it is nonetheless scary as all hell). The list of contributors for this one continues to grow and includes some great writers and friends of this blog, so make sure to check out the guidelines and sign up if you are so inclined. As previously mentioned, Brandie will be taking a few weeks off while she recovers from surgery, but she will still have a presence on the blog via some previously-scheduled entries. You can also check out some of her recent DVD reviews over at Cinema Sentries. In the meantime, we hope you enjoy what True Classics has to offer as we finally move back into full-time blogging! Some intriguing concepts, leading to some interesting reading. Looking forward to it. Hooray! Glad to see you’re back!